Baby Roues is proud to introduce the first compact and lightweight luxurious infant-to-toddler Bassi..
Englacha 2-in-1 Cozy B Rider is the most universal 2-in-1 stroller board available in the mark..
A Universal 2-in-1 ( Seating and Standing ) board for children that will attach to almost any&nbs..
Roomy and full-featured travel system A real lightweight high-end strollerSpecifications:.. The Letour Avant is a luxurious stroller with amazing features. Foam filled tires, leather.. The Letour Avant LUXE is a luxurious stroller with amazing features. Deluxe leatherette canopy and b.. The Letour Avant ONYX is a luxurious stroller with amazing features. 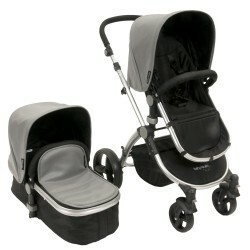 Deluxe leatherette enhanced emb..
A deluxe and versatile double stroller that grows with your family. The Duet can be used as a single..
Babyroues is proud to introduce the first compact and lightweight luxurious infant-to-toddler Bassin..
3-in-1 top-swiveled stroller with convertible seat A unique stroller you can't find f..